Master Jenkey released version 13.3.3.1 for PES 2013. Get it from our Download Center. Update : faceserver supports online playing and fixed minor bugs for kserver and afsio modules. Master Panos released 3 great tools for PES 2013. PES Stadium Modifier ( It's a tool that can be used to modify some more parameters and info about the stadiums that wasn't possible before ) , Camera Maker ( A new tool that allows you to create a new camera, or modify an existing one ) and Stadium Adder ( Add and not replace stadiums in PES2013 ) Get them from our Download Center! Version 13.3.0.0 of Kit Server for PES 2013 has been released by master Jenkey. Now with support for PES 2013 version 1.03. Get it from our Download Center. Master Jenkey released version 13.2.0.0 of Kit Server for PES 2013. This version updates Kit Server to make it compatible with PES 2013 Version 1.02. This is an early build of this new version. A new version that suppots PES 2013 V 1.03 will be relased later. Michal Widzew released Boots Changes 2013 for PES 2013. This application allows you to edit Boots name, Brand, Material and Color name as well as change boots stats. Get it from our Download Center. 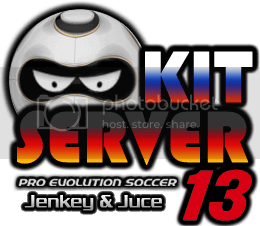 Jenkey released Kit Server 13.4.0 for PES 2013. It includes update for official patch 1.04. Available modules : afs2fs, afsio, lodmixer, speeder, ballsrv, sides, fserv, kserv. Get it from our Download Center. Mod for PES 2013 game, created by AntonicPG. Mod for PES 2013 game, created by OnurCetin35. Mod for PES 2013 game, created by juliancames. Mod for PES 2013 game, created by silasmendes. Mod for PES 2013 game, created by iAMIRi. Mod for PES 2013 game, created by luisdavilab. Mod for PES 2013 game, created by Pantel G7. Mod for PES 2013 game, created by IMAN. Mod for PES 2013 game, created by diavolo86. Mod for PES 2013 game, created by alipes98. Mod for PES 2013 game, created by cristiano7. Mod for PES 2013 game, created by Hawke. Mod for PES 2013 game, created by KleytonSCR. Mod for PES 2013 game, created by eohugo20.